"This is a real Southern chicken dish. The buttermilk tenderizes the bird and the bacon fat brings back the down home flavor!" Place the cut up chicken into a large resealable bag or a 9x13 inch casserole dish. Pour the buttermilk over the chicken, seal or cover and refrigerate for 24 hours. Remove the chicken from the buttermilk. In a bowl, stir together the salt, black pepper, cayenne pepper, thyme, flour and sugar; pour onto a plate. I prepared this recipe as directed. I was disappointed at the outcome and my family was less than impressed. I will not be making this anytime soon. I made this chicken on the 4th of July for the first time, it turned out great everyone loved it. thanks for the great new way to add flavor to my chicken. Very, VERY good. Came out a lot like fried chicken, just baked in the oven. The family loved it. 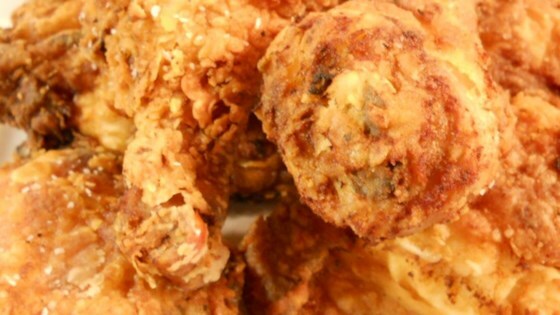 This is a great recipe my family has enjoyed numerous times! This is a great recipe. I did not have shortening on hand, so used corn oil with the bacon grease---my husband raved over the taste!! We will definitely make it again.